T'nalak, the traditional cloth of the T'boli people in South Cotabato, is made of abaca fibers and hand woven with the use of a backstrap loom. I was eager to see it and find out more about the communities that create them. 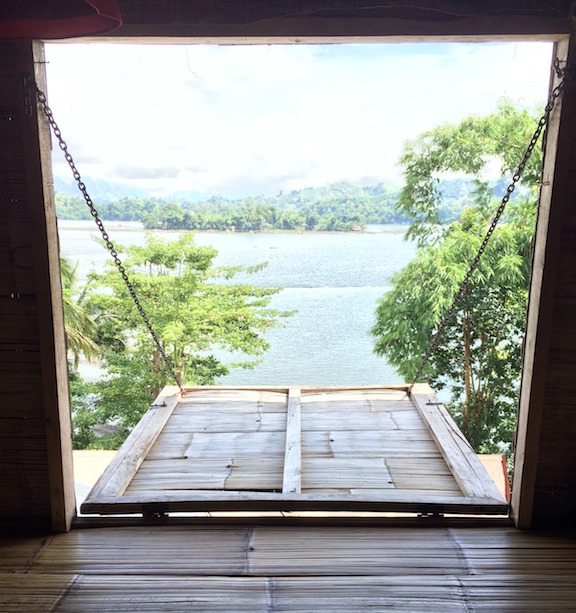 At the tail end of our July trip to the Philippines, we went to Lake Sebu, South Cotabato in the Mindanao region for the annual T'nalak Festival to search for fabric. It was the farthest south we've ever been and our first time in Mindanao, which has a reputation of being the country's wild west. What we found was a peaceful and beautiful setting rich with culture. We took a boat tour around Lake Sebu one cool, overcast morning. It was a beautiful tour, and what struck me most is how unspoiled everything is. Life around here is pretty much the same as it was 50 years ago. The famed giant fish floating restaurant. We were able to walk right up to the first waterfall. The second and third were viewed from cliff edge gardens. The rest we saw from a bird's eye view. We saw these two girls collecting shells by the waterfalls. We'll come back to them later. We ziplined to see waterfalls 4 to 7. After our boating and zip-lining adventures, we went to see Lang Dulay, the famous T'boli dreamweaver and national living treasure. She dreams the geometrical patterns for the T'nalak cloth and is one of the few surviving T'boli dreamweavers. Abaca fibers are smoothed and softened with a seashell. What an honor to meet artist and dreamweaver Lang Dulay. After Lang Dulay's we visited COWHED (Cooperative of Women in Health and Development), which sells traditional crafts made by local T'boli women at the Gono Kem Bo-i (Princess House). In addition to the T'nalak cloth, the T'boli people are also skilled embroiderers and brass artisans. A view of Lake Sebu. Remember the two girls picking something in the water by the waterfalls? They were hand-picking shells to be individually hand-carved into mother-of-pearl beads and hand-stiched into a kegal bintilas, the traditional top for T'boli women. The handmade nature of this intricate garment is mind-blowing. Each artisan makes different patterns with the beads and red trim so no two are alike, but it always has a black base, red trim and white beads. There are variations of this garment made with sequins instead of mother-of-pearl for a more affordable option. I often get asked by friends where I got my dress/bag/etc. A lot of times I get them from my travels, so I've started buying doubles of the most unique items I've gotten for myself. This is one of them :) I have an extra kegal bintilas with mother-of-pearl beads in size small. Check it out in the Sugarcane Shop under globetrotting souvenir. You can find plenty of jewelry, decorative items, trinket boxes, and even hair brushes made of brass. Brass bells and hand-loomed fabrics. Sitio Tuko-fol, Surallah-Lake Sebu Rd. c/o Santa Cruzz Mission #18 Alunan Ave.